The Süleymaniye Complex (kulliye) sponsored by Süleyman the Magnificent and built in Istanbul by the great architect Sinan (1489-1588) between 1550 and 1557, is the largest of the Ottoman building enterprises. It is functionally designed as a socio-religious centre with geometrically organised dependencies. It follows the example of the Fatih Complex, but architect Sinan made its architectural qualities vastly superior. The courtyard is surrounded by streets where there are schools (madrasas) for different levels of education, a medical school, a large hospital and other social buildings were set up on the slopes of the terrain. As for the architectural characteristics of the Medical Madrasa, we can begin by saying that it was planned as a component of the Süleymaniye Complex. Ottoman medicine reached a formal teaching institution with the Süleymaniye Medical School. Thus, this should be examined within the system of a multi-functional building complex. The Medical Madrasa, with a perpendicular plan, is composed of twelve domed-cells parallel to the shops in the Tiryakiler Street which is located in the south-western part of the Süleymaniye Mosque. A physical relationship existed between the Medical Madrasa and other components (public kitchen). A kind of division of labour shows itself with respect to these components. The medical students depending on the Madrasa used the cells as a dormitory, had free meals cooked in the kitchen of the imaret, used the hospital Dar al-shifa for practicing the theoretical lessons they learned in the Medical Madrasa, received their medicine from the drugs house: Dar al-akakir, and after being cured in the hospital, they would stay in Tabhane for the period of convalescence. The construction of this madrasa is considered to be a new stage in the history of Ottoman medical institutions. Unlike the previous traditional hospitals, which had medical education in their bodies, Süleymaniye was the first medical school in the Islamic civilisation to have a deed of trust (waqfiyya) mentioning its character as an institution for medical learning. 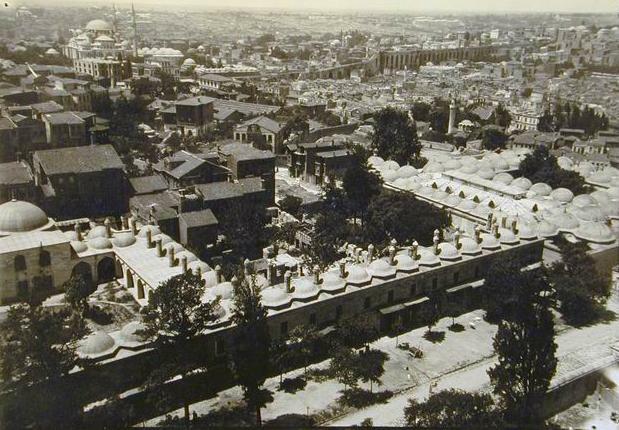 The Medical school, which consisted of a section of the Süleymaniye complex and is described in the charter as "the good madrasa which will house the science of medicine," was the first medical school built by the Ottomans. The Medical Madrasa was established to train specialised physicians and occupied a very important place in the field of Ottoman medical education in terms of medical specialisation. Medical education, which had previously taken place in hospitals, acquired an independent institutional structure with the founding of this school. The entrance to the medical school, which is located across from the hospital of which only the south-western wing has survived to this day, opens out onto Tiryâkiler Market. The north-eastern wing of the structure is located above the arches and shops of the market. Süleymaniye Medical Madrasa was the first institution which was built next to Dar al-Shifa in Istanbul. Süleyman the Magnificent ordered the establishment of a medical madrasa in his complex to educate highly skilled physicians for both public and army needs. The Medical Madrasa and the Dar al-shifa buildings as a component of the complex were built side-by-side to provide both a medical education and a public health service. This is very similar to contemporary university hospitals. In the complex, which was based on a very large area, Sinan had planned at one corner as a medical education and health site and put them on a parallel axis by two rectangular courtyards with a separate block. The idea of two buildings together, a Medical Madrasa and the Dar al-shifa, is considered superior in application and was ahead of its time. The medical student after having a theory lesson would go to the Dar al-shifa straight away to put into practice what he had learned. Hence, the Süleymaniye Medical School and Dar al-shifa had a very important place in the history of medical education and its application to a hospital. According to the deed of the complex the Medical Madrasa had a very basic and small staff. One Muderris (lecturer), eight danismends (student) and three auxiliary staff who are noktaci (assistant), bevvab (door keeper) and ferrash (cleaner) were assigned. There was a muderris as head of the madrasa, just as the other madrasas. However, there were some special conditions for a muderris of a medical madrasa, they had to be well educated in the medical sciences and be able to direct the students through the medical sciences. The first teacher at the Süleymaniye Medical School was Tabib Ahmed Çelebi b. Isa Çelebi who received sixty akças per day. Although the deed mentioned the daily wage of the muderris was twenty akças per day, he was receiving a higher salary due to his level of skills in medicine. Some of the Medical Madrasa muderrisses were appointed to other medical institutions as a shagird. As we see from the documents, some famous physicians were appointed at the medical madrasas as muderris, such as chief physician Büyük Hayatizâde Mustafa Feyzi, Ayasli Saban Sifai, chief physician Ömer Efendi and chief physician Gevrekzâde Hasan Efendi. Figure 2. 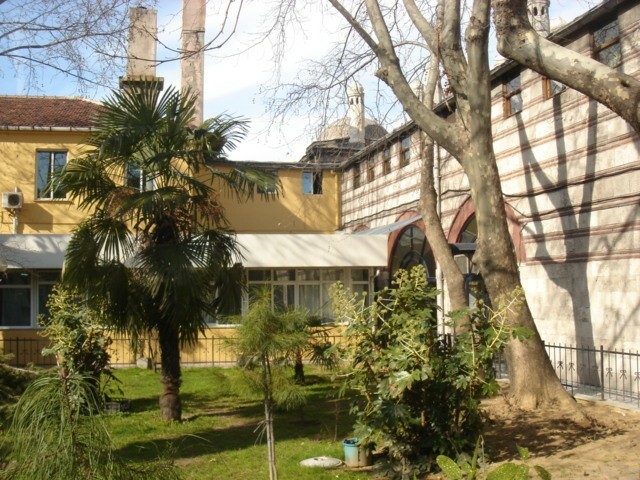 The Süleymaniye medical school and its garden. Although we have no sources available that fully explain the teaching and the educational methods followed in the Süleymaniye Medical Madrasa, it is understood from its deed that the constitutions for courts and madrasas (ilmiye kanunnameleri) and primary sources belonging to the classical period (1300-1600) was formerly taught and carried out in terms of the master-apprentice method. This practical method was also popular among other medical and social institutions such as the trade market system and ahl-i hiraf (artisans) organizations. This system was also common before the Ottomans in the Seljuk period. The textbooks used in the Süleymaniye Medical Madrasa are only generally mentioned in the deeds and other sources. They were teaching the famous medical text books at the Medical Madrasa. Although the deed does not mention the names of the textbooks, we do have a list of books which were given to the head physician to teach. In the list we find sixty-six famous medical books of which eighteen were written by Ibn Sina. Although there is no indication that these books were given for Medical Madrasa teaching purpose, we can say that at that time these books were circulating between physicians for educational purposes. On the other hand, according to the deeds, courses on logic (ilm-i mizan), medicine (ilm-i abdan) and rational sciences (fenn-i hikmet, ulum-i akliye) were also somehow taught at the School. In the deeds, there is no clear statement about the days and hours of the courses. In general, we know that Süleyman the Magnificent stipulated the teaching of five courses a day on four weekdays. It is thought that pre-Ottoman practices were followed by taking Tuesday, Thursday, and Friday as holidays. Festival days were also holidays and the rest was for teaching. But these holidays could be decreased accordingly. There is no exact information how many years medical education lasted at this madrasa. Ahmed b. Ibrahim, who is the author of Tashil al-tadâbir, mentioned that he himself graduated at the Süleymaniye Medical School after fifteen years and then became a physician at the palace. From his case, we understand that the educational process was very long. Most of the physicians appointed to the palace as a palace physician were selected from amongst physicians who graduated at the Süleymaniye Medical School, and of course suitability was a very important point for appointments. Abbé Toderini, who lived between 1781 and 1786 in Istanbul, provides information on the teaching method in the Medical Madrasa of Süleymaniye in a chapter of his famous book De La Littérature Des Turcs. According to Toderini, Turkish medical lecturers taught courses in general pathology and surgery in Süleymaniye for four days of the week. In addition to medical students, the courses were open to those who wished to attend. There was no barrier to francs (Europeans) attending these courses. Ubezio, a European physician, said that he followed the courses many times as a listener. The teaching method consisted of reading medical books, studying diseases and medicines through clinical observations and benefiting from physicians' knowledge and advice. The Süleymaniye Medical School offered medical education for about three centuries and was the institution which provided doctors for almost all the Ottoman medical institutions, and mostly for the Fatih Hospital in Istanbul. The Süleymaniye Medical Madrasa's graduates or students such as Osman Saib Efendi, Abdülhak Molla and Mustafa Behçet Efendi were among the founders and teachers of the modern medical school in 1827. Thus, they pioneered the modernising of medical education in Turkey. The School most likely continued to train students until the middle of the nineteenth century, until, that is, sometime after the new medical school (tibbiye) opened. The founders of the Tibbiye in Istanbul (1827) composed the staff of the Medical Madrasa. After the Second Constitutional Period (II. Mesrutiyet), the Süleymaniye Madrasa was included in the body of "Dâru'l-hilafeti'l-aliyye Medresesi" which was planned to assemble all the madrasas of Istanbul under one roof. It is understood that the Medical Madrasa was out of use and needed restoration during the year 1914. It also seems that on 21 December 1918, this madrasa was used by people who had lost their homes during a fire. Since 1946, after a full restoration, the building was used as a Maternity Clinic (Süleymaniye Dogum ve Çocuk Bakimevi).